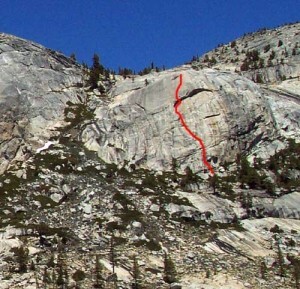 Yosemite masters Jim Bridwell and Roger Breedlove established this classic in 1973. Hoodwink lives up to its name, which, if translated into modern climbing lingo, might be called “Sandbag.” Most of the route is well protected. However, if the fixed piton on the crux roof pulled you would take a bad fall. Because of this, only confident 5.10 leaders should do this pitch. Which SuperTopo guidebooks include a topo for Hoodwink?